My wife Sandy and I are both avid sailors, although for many years we didn’t actually own a boat. To get our sailing fix, we simply chartered a yacht in a variety of destinations. And then one fine day, we came across a used boat for sale that perked our interest. After scoping it out, we made an offer conditional on a successful sea trial and marine survey. 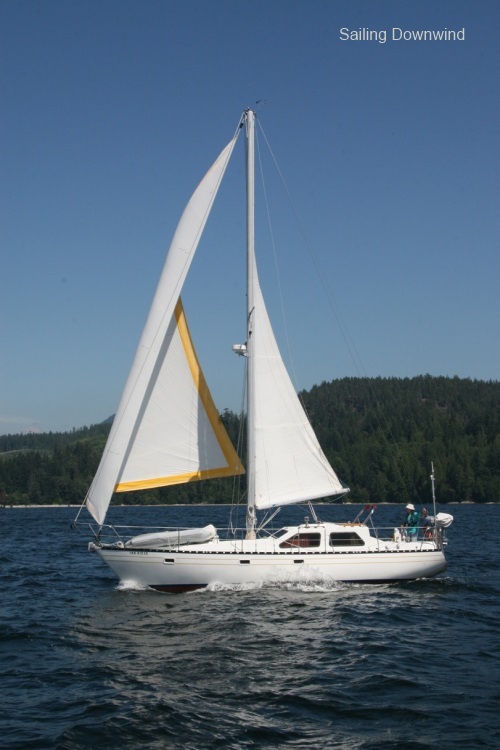 All went well; after completion of the paperwork, we became the proud owners of a 36-foot cruising sailboat. Wind Dancer was lying in Ladysmith Harbour on Vancouver Island while our home marina was in Powell River on the BC mainland, about 60 nautical miles north. According to our calculations, if the wind blew briskly from the south, we’d be home in a few days, allowing some time for sightseeing. After accepting the keys, we spent our first day provisioning and planning tentative routes, keeping in mind that we would only sail with the wind. The next morning, following a joyous christening, we began our maiden voyage by motoring out of the harbour into dead calm conditions. 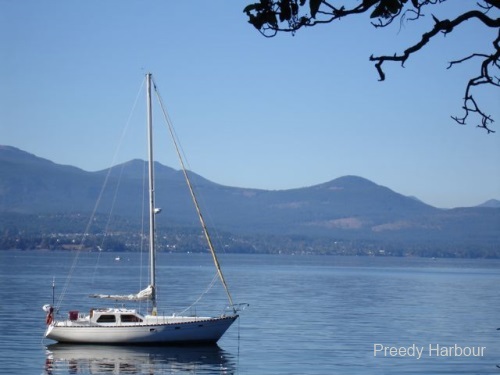 The closest land was Thetis Island where we dropped the hook in Preedy Harbour and explored the grounds of Capernway Retreat: 97 acres of woods, meadows, and seashore. We spent the better part of an hour on an elevated point, admiring the well-protected harbour and of course our very own boat bobbing, oh so gently, in the quiet anchorage. Had the wind been suitable for sailing, we likely never would have discovered this enchanting setting. Chalk one up for no wind. Getting underway the following day, we eagerly hoisted our sails to run with a faint northerly. Unfortunately, a southerly current had other ideas, resulting in zero headway. After an hour of senseless flopping about, we motored the short distance to Chemainus, a charming town with the world’s largest outdoor art gallery — 33 colourful murals painted on business establishments — and a jolly good ice cream shop to boot. Another fortuitous encounter, again the result of no wind. I was beginning to think, somewhat radically, that sailors can have a good time, even without wind … or to put it another way, it’s not the journey that matters, it’s the destination. Did I get that right? In two days, we had traveled a total of 8 miles, all under power. Our idyllic notion to sail with the wind was clearly responsible for our mollusk pace: at this rate, we might make it home within the year. Several feeble efforts to rely on wind power gave us renewed appreciation for the achievements of legendary sailors Lin and Larry Pardey, who circumnavigated the globe in both directions without auxiliary power. I can only imagine the exhilaration they must have felt being whisked along, at least easterly, by the consistent trade winds. Conversely, our plight was more akin to the early sailors stalled in the horse latitudes, having to throw livestock overboard to save provisions. Our situation wasn’t quite that desperate just yet, but you get my drift … oops, bad choice of words! Hooray! On the third day, a northerly perked up to about 10 knots encouraging us to head south wing-on-wing into Samson Narrows, an S-shaped channel leading to the entrance of Cowichan Bay. When we made our first turn, the prevailing wind shifted directly onto our bow, prompting a U-turn which would have taken us back to the spot where the wind would dictate another 180. Had we adhered to our sail-with-the-wind rule, we might still be frolicking to and fro in the Narrows. Furling the sails, we motored to the Dungeness Marina in Cowichan where Sandy and I discussed the need for a change of mindset about our new sense of freedom that came with boat ownership. We concluded that sailing ONLY with the wind depends on at least two factors: infinite patience and the degree of urgency to get someplace, like home. Now, if we were to live on our boat, we would only have one factor to consider, which in my case is the deal breaker. Patience is not my strong suit — whenever our speed drops below 2 knots, I reach for the ignition key. To this day like most sailors, we still prefer to sail with the wind at our backs. But now and again, we find ourselves beating, motoring, or both, much like our chartering days, to get to a predetermined destination. By the way, we did make it home in a few more days, doing just that. Obviously, the Greek God of south wind, Notus, was busy elsewhere during our voyage.